On this flight you'll use a short-field technique to take off from the private runway on Catalina. You'll then track a VOR radial inbound to Van Nuys Airport, and along the way you'll do some experimenting that will make you more adept with your NAV receivers. The path of the flight is shown in Figure 2-4. Short-Field Takeoff. When the runway is very short, a slightly different takeoff procedure is used. Drop 20° flaps before you start the takeoff roll; when you begin the roll, let the airspeed increase to about 80 knots, and then use a bit more up-elevator than you use ordinarily. This will cause the airplane to leap more rapidly into the air, and will give you a steeper initial climb, so you'll clear obstructions such as trees and power lines at the end of the field. Then, after clearing the obstruction, you can raise the flaps and establish a standard rate of climb in the normal way. VOR Locations. Take a look at your Los Angeles Area chart. At a number of places, you'll notice a VOR compass rose—a circle about an inch in diameter, with compass bearings marked around the perimeter and a small hexagon at the center. On the Flight Simulator charts—as well as on official aeronautical charts—this symbol is used to mark the locations of VOR transmitters. Each such compass rose also has a box nearby giving the name of the VOR station and its frequency. The VOR we'll use on this flight is Van Nuys The compass rose for that station has been omitted on the chart (for clarity), but the box with the name and frequency is there, just a bit north of Los Angeles. There's another VOR at Los Angeles International, and you'll be tuning NAV-2 to that one just as a reference, while NAV-1 will be tuned to Van Nuys. There are two potential sources of confusion in the use of VORs, but let's get into the air so you can try things out for yourself. 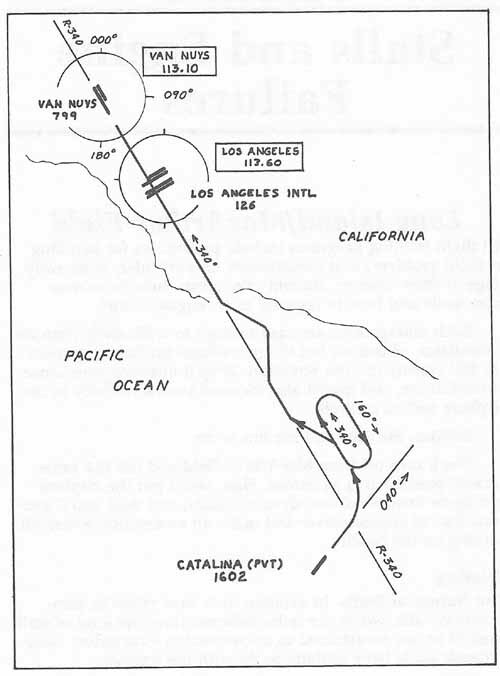 Catalina has only one runway (4 and 22). You'll use Runway 4, to take off to the northeast. Taxi ahead and do a 180 to the right onto the threshold. This runway is very short, so start your takeoff roll from the very beginning of the pavement. First taxi into position and stop, with a heading of about 037°; then tune both of the NAV receivers as indicated. Departure. Before you start to roll, note the airport elevation. It's 1600 feet, with a sharp drop-off to sea level right at the end—something like an aircraft carrier, only with a longer drop. When you're ready, lower 20° flaps, then accelerate to about 80 knots before rotating, as described above. When airborne, raise the flaps and establish a normal rate of climb. Initial Turn. When you've established a steady 500fpm climb, begin a shallow left turn to heading 340°. Level off at 3500 feet. The NAV Receiver Window. When you're straight and level at 3500, on a heading of 340°, note the indications in the NAV-1 window. (Just ignore NAV-2 until later on.) The omni bearing is set to 340, and right now the needle is to the left. Therefore the Van Nuys 340° radial is to the west of our present position. The TO/FROM Flag. Notice that the flag in the window says TO, because the OBI is set to 340, which at this point in the sky is the bearing TO the station. Now, just for practice, make a 180° standard rate turn to the right. The gyro compass shows your present heading as 340°; the reciprocal readout is 160°, so turn right to heading 160°. Remember to keep the nose from falling while you turn, to maintain the proper bank, and to try to roll out right on 160°. When you're straight and level on heading 160° (with altitude still at 3500), note the flag in the NAV-1 window. You're now headed away from the station, but the flag still reads TO rather than FROM. This, again, is because the OBI is set to 340, which at this point in the sky is the bearing TO the station—regardless of the aircraft's heading. Now make another standard rate turn to the right, back to our original heading of 340°. Intercepting the Radial. You're far from the station now, so out here the 340° radial is pretty wide. It's like a flashlight beam, spreading out as it gets farther away from its source. You're also not too close to the radial itself, so a 30° interception angle should work out well. Using half-standard turns, turn left 30°, to heading 310°; hold that heading until the needle is almost centered; then turn right 30° to 340° again, to track the radial inbound. Reverse Needle Responses. When your heading is 340° with the needle centered, toggle the omni bearing selector for NAV-1 until the bearing shown is 160° instead of 340°. The needle will be centered again, but with the flag reading FROM instead of TO. Now try a very useful experiment: Turn right to heading 010°; fly away from the radial for two minutes; then turn left onto heading 340° again. You are now flying parallel to the radial, which is over on your left. But look at NAV-1, where the needle is now on the right side of the window instead of on the left. If you wanted to intercept the radial now, and if you turned the airplane in the direction indicated by the needle as you ordinarily do, you'd turn to the right, and you'd be flying farther away from the radial instead of toward it. The reason, of course, is that we've selected the wrong bearing on the omni bearing selector. On this particular spot in the sky, the inbound heading on this radial is 340°, but the bearing now set on NAV-1 is the outbound heading of 160°, so the needle behaves in reverse. In effect, the NAV-1 receiver thinks the airplane is going in the other direction (in which case the radial actually would be to the right instead of the left, and the needle would then be reading correctly). At one time or another, when you're trying to intercept a VOR radial you'll suddenly find that something isn't right—the needle just won't center, and in fact appears to be responding just the opposite from how it should. When that happens, check your heading against the setting of the omni bearing to be sure you haven't inadvertently selected the reciprocal. It will definitely happen to you, eventually. There are also certain situations that you'll encounter later on, such as the localizer back-course instrument approach, when it's necessary to have the needle working in reverse in this way, and you'll have to interpret it accordingly. Now set the bearing to 340° again, get back on the radial, and resume your course of 340° while tracking inbound. Station Passage at Los Angeles. We should be approaching Los Angeles International Airport now—our course takes us right over the field. Recall that NAV-2 is tuned to that station, and keep an eye on the NAV-2 window as we come in right over the airport. As we cross over the station, which will occur about 17 miles DME from Van Nuys, notice the flag in the NAV-2 window as it changes from TO to OFF momentarily, and then changes to FROM. Approach to Van Nuys. Have the airplane set up for the approach before you're 12 miles DME from the airport. Note that the field elevation is 799 feet. We're in position for a straight-in landing on Runway 34 Left, but unfortunately the wind is wrong and they're landing in the other direction, so you'll have to fly the standard pattern and land to the south. At nine miles DME, throttle back and begin a 500fpm descent. Traffic pattern altitude is 799 + 800, or about 1600 feet. As you descend toward that altitude, begin to add some power and level off right at 1600. This is a good time to save the current parameters. Landing from a Standard Pattern. As you approach the airport at 1600 feet, circle around to the right, so you won't be heading into departing traffic. Enter the downwind leg with the airport on your left, and fly along outside the right edge of the airport on a heading of 340°. The San Diego Freeway is visible just on your right now, and you want to fly a bit closer to that highway than to the airport itself as you proceed downwind, to give yourself enough room for a base leg. Use the overhead radar view as an aid. Use standard rate turns now. For the base leg, turn to a heading of 250°. The final approach to Runway 16 Right will be on heading 160°. On the final approach, you'll hear a beep, and the beacon light at the upper right of the panel will start to flash. This is a response to the marker beacon on the ground that's used for the ILS approach to this runway. Ignore it for now—you'll use it on a later flight. Figure 2-4. Catalina to Van Nuys.